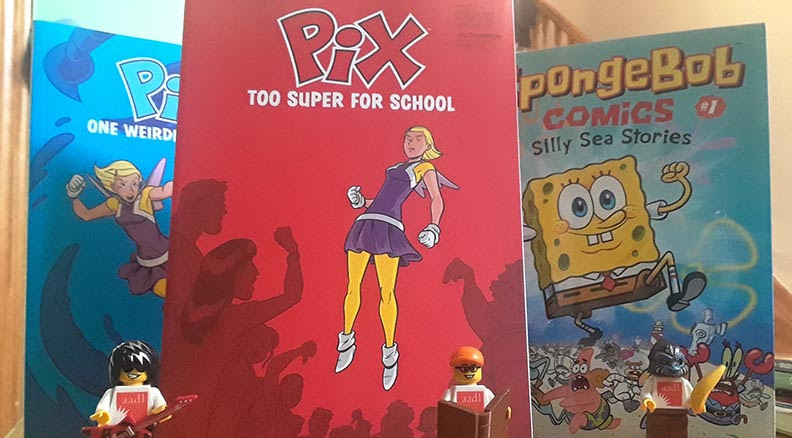 Gregg Schigiel’s original graphic novel, PIX: TOO SUPER FOR SCHOOL, took home two Kids’ Comics Awards at a ceremony held on Saturday, June 16th as part of the Ann Arbor Comic Arts Festival (A2CAF). PIX won in the categories “Favorite Author” and “Be Cool, Stay in School” (for books set in school). While kids and teens vote for the KCA winners (who receive a Lego mini-figure trophy), the final nominees and categories are curated by active and retired librarians based upon online open nominations and internal review of material released in the prior year. PIX, a superhero/fairy tale mash-up, follows the adventures of Pix, a teenage superhero who believes herself a fairy princess. TOO SUPER FOR SCHOOL, the second volume in the series, has Pix dealing with the challenges of her fairy beliefs and superhero actions at school. 2018 marks the sixth year for Kids’ Comics Awards. Other winners at the 2018 ceremony included Hilo by Judd Winnick, Phoebe & Her Unicorn by Dana Simpson, Brobots by J. Torres and Sean Dove, Science Comics: Dogs by Andy Hirsch, and the anthology SpongeBob Comics. Past winners include kids’ comics notables Raina Telgemeier, Jeff Kinney, Nathan Hale, Kazu Kibuishi and Chris Giarrusso. For more information about PIX, please visit http://pixcomic.com. For more about Gregg Schigiel, visit http://hatterentertainment.com.